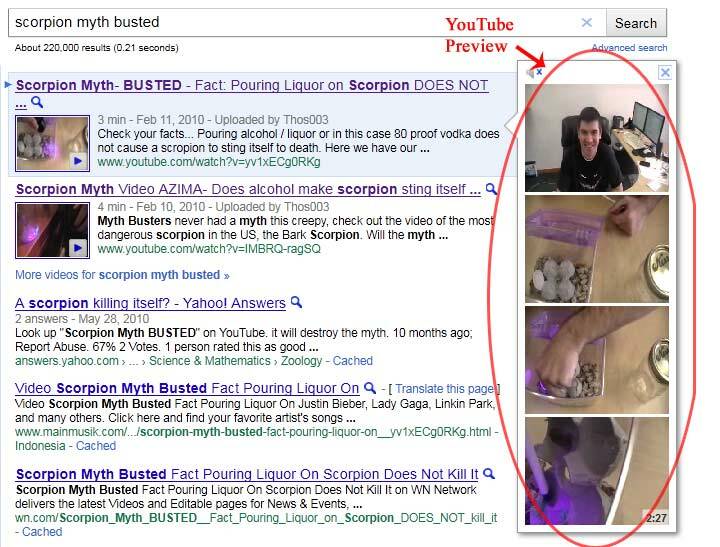 Just in today Google is adding a preview on Youtube videos in the universal search. Pretty Cool. You can click on the images to enlarge them. Ignore the silly guy in the scorpion pest control videos. Or if you want to see in live on Google then click here. Curious if this video preview will help or hinder click through rates. Any thoughts? Per a neighboring jeweler, local businesses are now being approach by google to take interior photos. They will be 360 degree, virtual tour type images added to Google maps. She said that Google came in, set up their camera, and begun snapping photos as the camera pivoted on its stand. Google will then take the images back and patch them together. Not too dissimilar to what Google Maps does currently with their images taken from on top of their cars to create their street views. Not only is Google staying ahead of the competition with this new addition to their maps, but in the same swoop they are verifying that stores and locations on Google maps are legit. This is a great step toward reducing current falsified locations within the maps. Further, Google is engaging their customers. This additional interaction with customers will aid the ever so elusive Google in become more trusted. Google is moving forward and putting more feet on the ground. They are making their maps more relevant and their directory more enhanced. And in classic Google fashion, these images are being done at Google’s expense and offered to the business owners for free. Who is going to refuse free advertising and free Google maps enhancements? There are a few reasons that owners may want to refuse Google’s hospitality. The most predominant would be the security of their shops. Thieves would love the opportunity to peek inside the vault without ever entering the premise. If a thief were to stage a heist they would most like scout the area prior to performing the robbery. If a local shop lays out their floor plan online their properties would be more tempting targets as potential thieves would have no risk of being seen on camera prior to a heist. As with any move a business makes there is potential risk and the ever looming opportunity cost. In weighing the benefits vs the risks it would be hard to refuse Google’s offer. Any enhancement that provides a competitive business more opportunity to strut their stuff allowing consumers to compare the competition would be welcomed by the confident business owner. And thus the confidence of the business would be conveyed to the potential buyers hopefully instilling a heightened sense of security and leading the consumer closer to a buy. And a good business would have nothing to hide, making non compliant businesses less trustworthy and/or simply less interesting. Reporting live from the Phoenix Airport while surrounded by 5 little birds…. who’s doing Sky Harbor’s bird control? This is your local pest control guy.